Published: Oct. 9, 2012 at 03:51 p.m. Updated: Oct. 9, 2012 at 06:33 p.m. The San Francisco 49ers were widely considered to be the top team in the NFC prior to the 2012 season largely because of their championship-caliber defense. Through the first five weeks, though, it seems coach Jim Harbaugh has assembled an offense that is nearly as potent, featuring a powerful running game and an explosive aerial attack. 1. 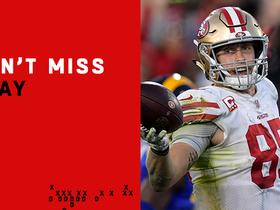 The 49ers' power running attack wears down opponents late. Though the rest of the NFL is emphasizing passing, the 49ers have pushed their way to the top with an old-school approach that relies on a power running game. San Francisco, which leads the league in rushing yards per game (195.8) and yards per attempt (6.1), pummels opponents with an assortment of hard-hitting inside runs from a myriad of run-heavy formations that wear down the interior of the defense. Frank Gore spearheads the attack with a relentless running style that combines physicality and toughness with speed, quickness and vision. He explodes through holes at the point of attack and has the patience and awareness to pick up positive yardage when lanes are clogged. 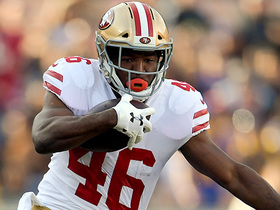 Gore's persistence typically produces huge gains in the second half, after opponents have grown weary of banging into the 49ers' big, imposing offensive line. 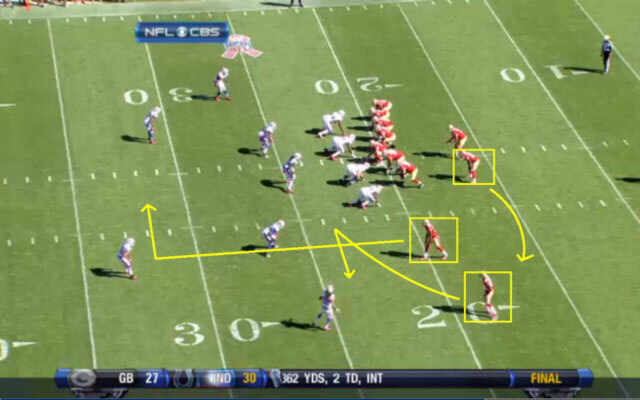 In the screengrab below, taken from the Niners' win over the Buffalo Bills on Sunday, San Francisco is running an inside zone power, with tight end Delanie Walker working through the line to cut off the strong-side linebacker. Gore will attack the line heading in one direction before immediately looking to cut back behind the double-team block from the center and left guard. Gore finds an open seam and follows Walker's lead block to a 19-yard gain against the Bills. Click here to watch the full play. Kendall Hunter has also been a prominent part of the 49ers' running game, spelling Gore on a rotational basis. Hunter isn't as big or physical as Gore, but he's mustered 5.4 yards per carry, and has found success with similar power running plays between the tackles. 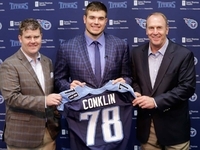 With two runners who can grind out tough yards in a phone booth, the 49ers are able to persistently attack the interior of defenses with a flurry of jabs, softening opponents up for a knockout blow in the fourth quarter. 2. A deeper receiving corps makes Alex Smith more difficult to defend. It's no coincidence that Smith is enjoying the best season of his career after the 49ers spent the offseason upgrading their skill positions. Some would argue that receiver Randy Moss has been a disappointment based on his production, but there's no denying that he and receiver Mario Manningham provide more explosiveness on the perimeter. Manningham in particular has been an outstanding complement to tight end Vernon Davis and receiver Michael Crabtree in the passing game. Manningham has the size, speed and burst to win one-on-one matchups, and he ranks third on the team with 19 receptions for 186 yards. Moss, who ranks fourth on the team with nine receptions for 99 yards, hasn't been utilized as much as some thought he might be, but he still threatens opponents with his ability to get down the field. 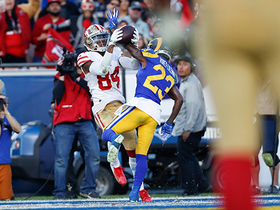 Inserted into the lineup as part of the 49ers' heavy formations, Moss prevents defenses from dropping the safety into the box to defend the run. In addition to opening up lanes for Gore, this lifts the coverage on Davis down the middle of the field. As a result, Smith has had an easier time connecting with receivers at every level; his completion percentage has surged to 68.1, and he has an impressive 8:1 touchdown-to-interception ratio. Smith's 108.7 passer rating leads the NFL; the 49ers are 13-0 when he starts and finishes a game with a rating over 100.0. 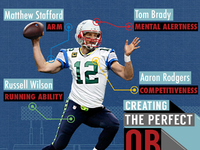 Let's take a look at how the 49ers have been utilizing their top aerial weapons. 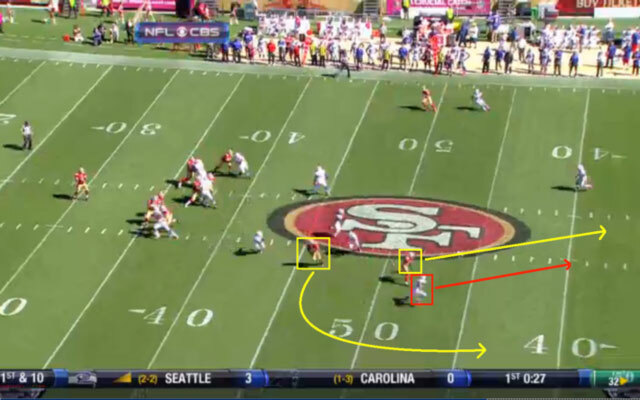 Vernon Davis: In the screengrab below, taken from Sunday's game, the 49ers align in a trey wing slot formation with Walker on the outside, Davis positioned on the right and Moss split out to the left. Walker and Davis will execute a post-wheel combination route designed to take advantage of the Bills' three-deep coverage. With the corner assigned to run with Walker on the post route, Davis is left wide open down the boundary on the wheel route, resulting in a 53-yard gain. 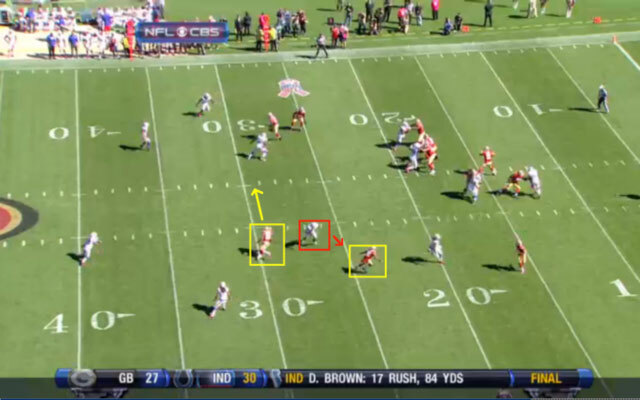 Michael Crabtree: In the screengrab below, taken from the same game, the 49ers are aligned in a tight wing slot formation, with Crabtree positioned in the slot. The 49ers are running a smash-dig concept, with Crabtree running the dig over the middle of the field. The Bills linebacker jumps the spot route, and Crabtree comes open over the middle of the field. 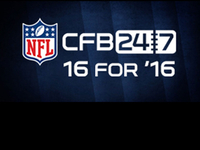 The play results in a 36-yard gain for Crabtree on a nifty catch-and-run. 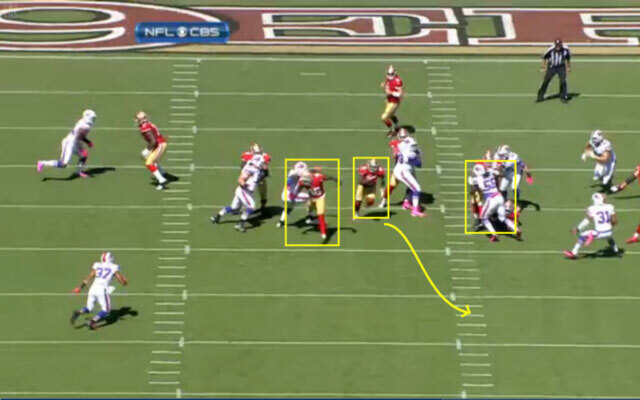 Mario Manningham: In the screengrab below, also from Sunday's game, the 49ers are aligned in a bunch formation to the left. 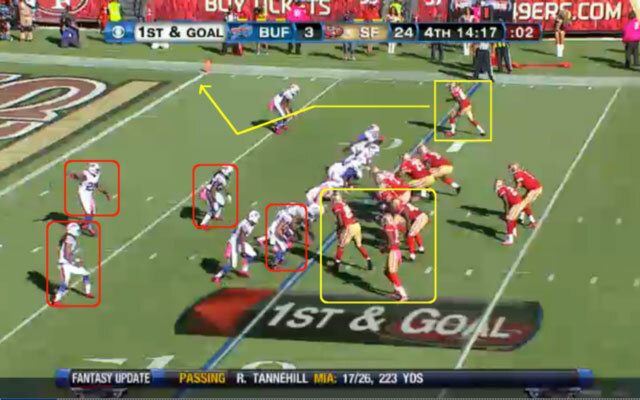 The Bills are playing man coverage, leaving Manningham isolated at the top of the screen. The cornerback is playing with heavy inside leverage; Manningham's post-corner route exploits this technique, and he grabs an easy 10-yard touchdown toss from Smith. 3. 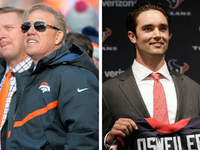 Greg Roman's creative schemes produce big plays. The 49ers don't get enough credit for using clever formations and gadgetry to create big-play opportunities. 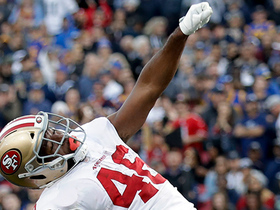 Harbaugh and offensive coordinator Roman routinely align the 49ers in quirky formations, looking for a numerical advantage at the point of attack that can lead to a huge gain on the ground. They also aren't afraid to call fly-sweeps or reverses to take advantage of aggressive defenders who overrun plays to the front side. I was surprised by how many of the 49ers' biggest plays over the past few weeks were the products of gimmicks or trick plays. 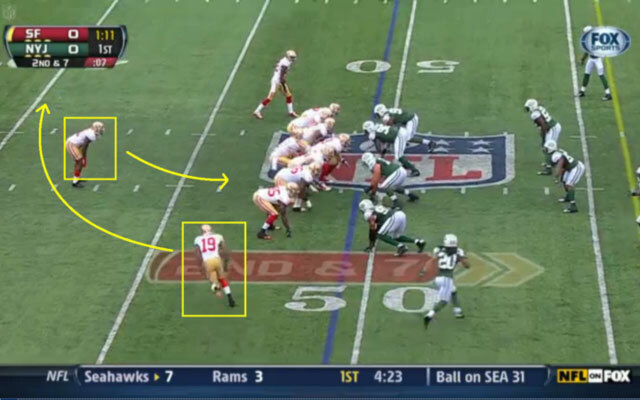 In a win over the New York Jets in Week 4, the 49ers broke out several deceptive plays to exploit undisciplined defenders at the point of attack. The constant deception kept the Jets from finding the ball, and the 49ers rolled up over 200 yards on the ground, dominating the game from beginning to end. 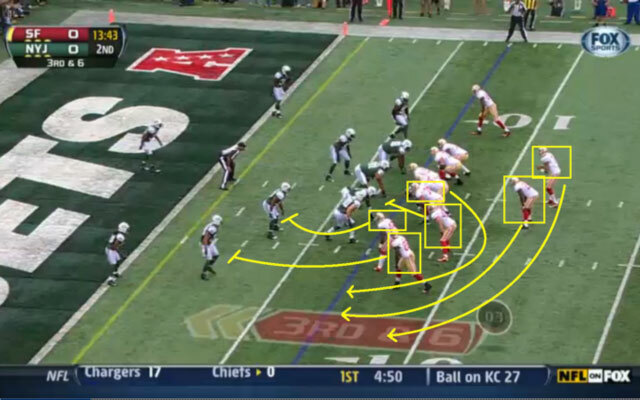 QB runs: In the screengrab below, the 49ers are aligned in a bunch formation to the left. Colin Kaepernick will take the direct snap and run around the left end, with a full convoy leading him into the end zone for a seven-yard score. By aligning in a cluster formation, the 49ers create favorable angles for the outside receivers to pin the Jets' perimeter defenders inside. Kaepernick quickly reaches the edge with multiple lead blockers in front. 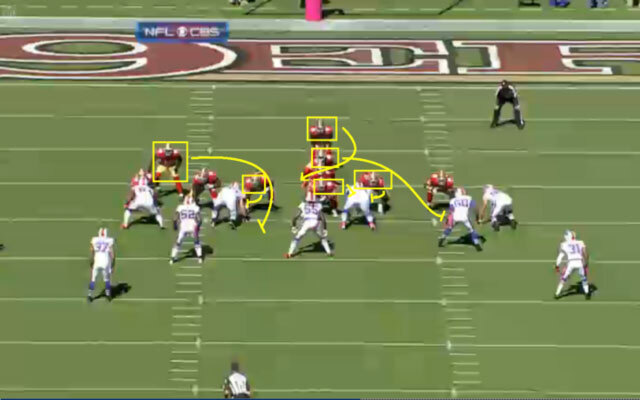 Reverses: In the screengrab below, the 49ers are aligned in an ace formation. Receiver Ted Ginn is in motion, as if he's going to run a reverse behind a play-fake to Gore. 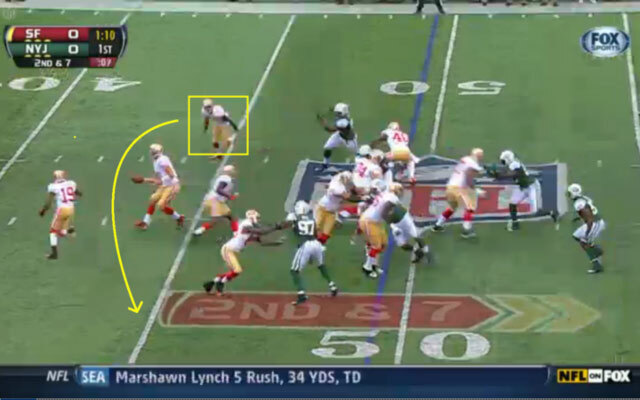 However, the 49ers fool the Jets, running the reverse to Manningham on the right. Manningham makes a few nifty cuts and finishes with a 28-yard gain. 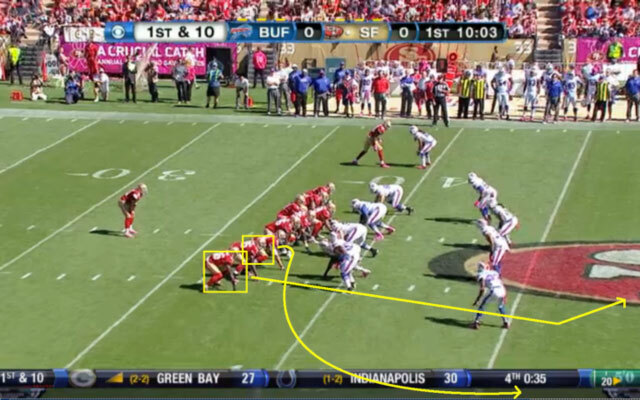 The 49ers didn't rely as much on tricks or gadgets against the Bills. But their consistent utilization of deceptive plays slows down defenders, leading to productive gains for the offense on basic plays.